This is a non-refundable deposit to reserve a quarter beef from our Fall 2018 harvest season. Your meat will be ready for your freezer mid November. Deposits should be made ASAP! We take orders on a first come, first served basis, reservations fill up fast, and we sell out every year. Once we pick up your beef from the butcher, you will be billed $7/lb boxed weight of your beef minus your pre-paid deposit. The average boxed weight (the amount of beef you take home) is 100-125 lbs. This price includes the fees from the butcher. You'll pay the balance due for your beef, and we'll pick up your meat and deliver it to you via one of our established pickup locations in the Hudson Valley, including our Farm. Please email Heather@jskcattlecompany.com for more details or with any questions. Our pasture raised beef beef is out to pasture all the time as is supplemented with non gmo corn silage and a ground corn/molasses mix from a local mill. 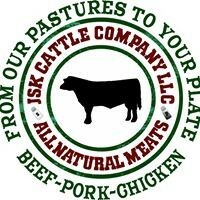 We have found our customers really like our pasture raised beef and describe it more the taste of a grain fed, but the health benefits of 100% grass fed/grass finished beef.